It is an 【official】 event to be held the day before RubyKaigi 2018. 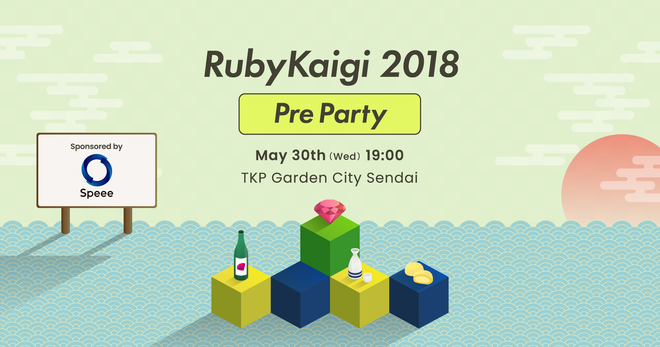 It is a valuable opportunity for Ruby Committers, RubyKaigi Speakers, Rubyist all over the world to gather, so it's time to host the official pre party as the exchange between Rubyist deepens and the RubyKaigi from the next day gets excited. Let's introduce each other to getting acquainted with everyone, share your passion for RubyKaigi, and have fun. We will also be sharing Sendai local information. Catering (meals / drinks) is available. Sendai confectionery is prepared with RubyKaigi special bag. Please contact us for any questions or inquiries from the inquiry form. Please check the Anti Harassment Policy & Accessibilitybefore applying. There is no cloak, but we have a place to put a big loading. We do not take care of valuable items, please manage your baggage and valuables by yourself. Regarding troubles, accidents, injuries, theft, loss, etc in the venue, the organizer and sponsor can not assume any responsibility. Please be sure to refrain from canceling after one week ago. There is a limit to the participation frame. If participation becomes difficult, please cancel early. seriincali published RubyKaigi 2018 前夜祭. I joined RubyKaigi 2018 前夜祭!